Cellular imaging of human tissues has been recognized for the past decade as an enabling advance in many clinical applications of optical coherence tomography (OCT). Current diagnosis and management of numerous human diseases, including cancers and various inflammatory and autoimmune conditions, depend upon biopsy and histopathologic analysis of cellular and subcellular features. Imaging cells with traditional OCT methods, however, has not been possible due to the limited transverse resolution of such techniques. 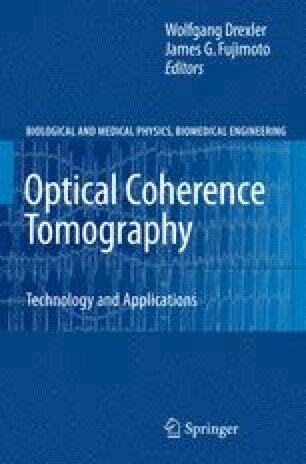 This chapter focuses on point-scanning, confocal OCM implementations, and this meaning of optical coherence microscopy should henceforth be assumed. The chapter provides an overview of OCM image formation and discusses several of the challenges and advantages of the technique. In addition, system design approaches for high resolution OCM are covered with a focus on reviewing enabling technological developments. Examples of cellular level imaging in human tissues are presented. The capability to visualize cellular structure promises to have important implications for many clinical applications, including optical biopsy and the detection of neoplastic changes.